ANZAC Biscuit Recipe and the History of ANZAC Day. ANZAC day, April 25, is a national public holiday here in Australia and it is thought by many to be one of the most solemn days of the year. This year it will be marking the 95th anniversary of the first major military action fought by Australian and New Zealand forces during WWI. ANZAC stands for Australian and New Zealand Army Corps. 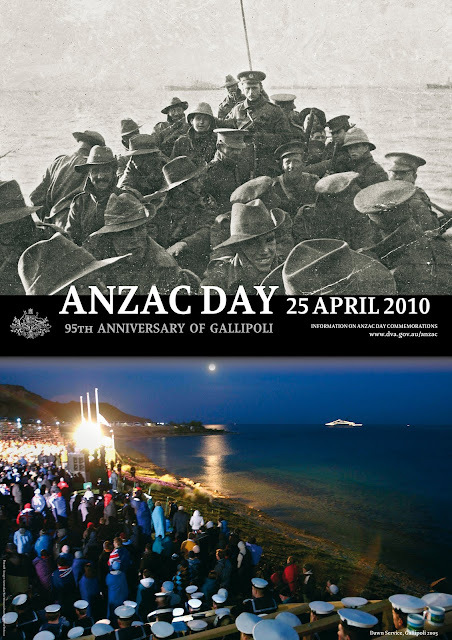 In 1915 Australian and New Zealand soldiers, the ANZACs, formed part of the allied expedition that set out to capture the Gallipoli peninsula in order to open the Dardanelles to the allied navy. The aim was to capture Constantinople (Istanbul) which was the capital of the Ottoman Empire and an ally of Germany. The Australian and New Zealand forces landed on Gallipoli on 25 April, meeting fierce resistance from the Ottoman Turkish defenders. What had been planned as a bold stroke to knock Turkey out of the war quickly became a stalemate, and the campaign dragged on for eight months. At the end of 1915 the allied forces were evacuated, after both sides had suffered heavy casualties and endured great hardships. Over 8,000 Australian soldiers had been killed. News of the landing on Gallipoli had made a profound impact on Australians at home, and 25 April soon became the day on which Australians remembered the sacrifice of those who had died in the war. Although the Gallipoli campaign failed in its military objectives, the Australian and New Zealand actions during the campaign left us all a powerful legacy. The creation of what became known as the “ANZAC legend” became an important part of the identity of both nations, shaping the ways they viewed both their past and their future. The meaning of ANZAC day today includes remembrance of all Australians killed in all the military operations in which Australia has been involved. Each year Australians and New Zealanders recognise 25 April as the day to remember those who fought and lost their lives for their country. Commemorative services are held at dawn, the time of the original landing, at war memorials in cities and towns across both nations. Later in the day, ex-servicemen and women join in marches. Another ANZAC tradition is baking ANZAC biscuits. 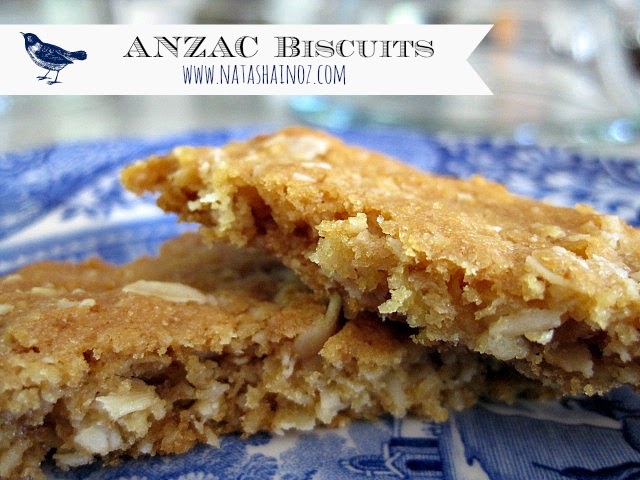 ANZAC biscuits were eaten by our troops on the shores of Gallipoli and the fields of Flanders. The army biscuit, also known as an ANZAC wafer or ANZAC tile, is basically a long shelf-life biscuit that was eaten as a substitute for bread. However, these biscuits were very, very hard, so hard that most of the soldiers preferred to grind them up and eat them as porridge. 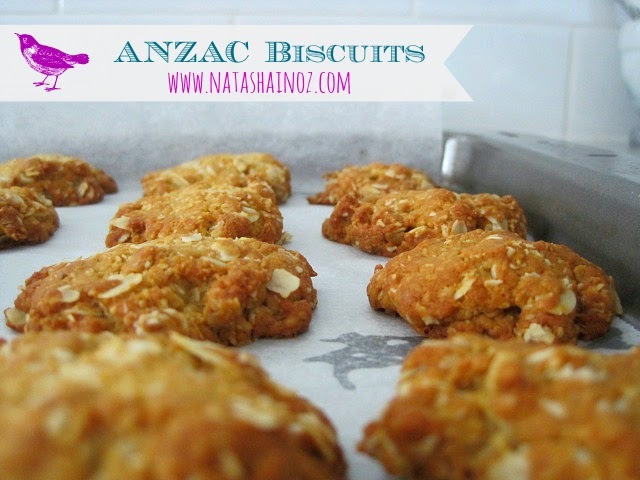 ANZAC biscuits are eggless so they wouldn't spoil before they reached the troops. Ingredients always include rolled oats, sugar, plain flour, coconut, butter, golden syrup or treacle, bi-carbonate of soda and boiling water. Watch out when making these! The mixture really froths up! I hope that maybe I can inspire you to make these delicious biscuits! This ANZAC biscuit recipe combines rolled oats, sugar, flour, coconut, butter and golden syrup to create the perfect Aussie treat. Set oven to 160C/320F and then line a couple of large oven trays with baking paper. In a large bowl, thoroughly mix together the oats, coconut, flour and caster sugar. Put the butter and golden syrup into a small saucepan over low heat and warm them or slowly microwave them in a large microwave safe dish (you will see why it needs to be large later), stirring occasionally, until the butter has melted. Then add the boiling water and bicarb soda and stir them in briefly. Watch out! The mixture froths up! Now pour this buttery liquid into the oat mixture along with the vanilla. 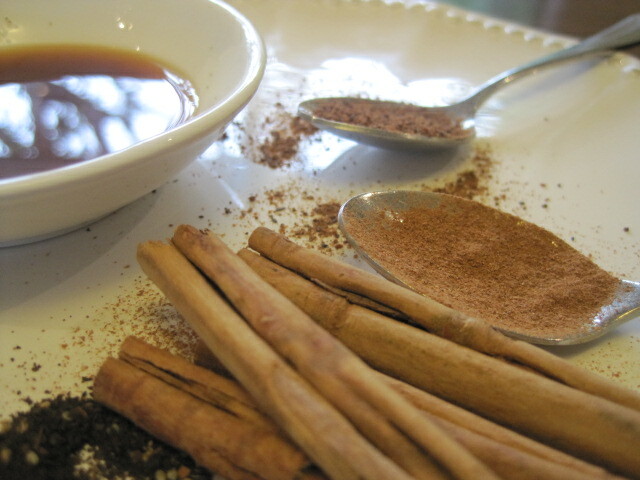 Quickly stir the two together until they're thoroughly combined. Roll the (now very sticky!) dough into walnut sized balls, flatten them slightly and sit them at least 5cm apart (as they spread quite a bit) on the prepared oven trays. Bake the biscuits for 15-20 minutes, or until they're golden brown and still a little soft. I rotated the trays halfway through the cooking time to ensure even cooking. Leave them on the trays for a few minutes, then transfer them to wire racks to cool. They keep well in an airtight container for up to a week....if they last that long! They keep well in an airtight container for up to a week....if they last that long! A note on Golden Syrup: I am not sure if my American friends have used Golden syrup before? It is a pale sweet treacle and you would be able to find it in specialty stores or those with international sections, such as Wholefoods Market, which apparently stocks Lyle's golden syrup from the UK. Thank you, thank you, thank you Michael Lee!!!!! Michael Lee is now hosting another Photo Contest, her 3rd! This time she would like people to submit pictures of MOSAICS. The contest ends April 30 so when you are over at Designs by Gollum looking at other yummy recipes check out all of the details. I am linking this post to my weekly Say G'day Saturday party, a friendly and international linky party where you can link up anything and everything...recipes, pinterest posts, instagram pictures, craft projects, tutorial and DIY tips. Finally, don't forget to join me on Tuesday for a #TuesdayTune. 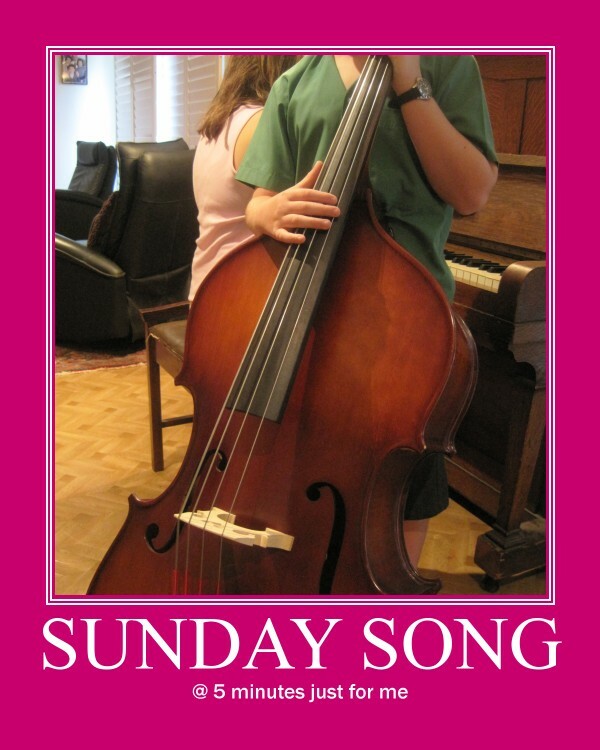 If you have a favourite song to share, please feel free to join in and link up! It can be from any of your previous posts and everyone is welcome-the more the merrier! This week I will be sharing some pictures from Sunday's ANZAC day parade and a song about our brave Aussie Soldiers. I hope you will come back to visit me then. I've heard of these cookies through other Australian bloggers, Natasha, but you are the first to put a recipe for them in a post. If I can find the golden syrup in my local Whole Foods I think I'll try making them as they look very good. Remembering and honoring all the brave ANZAC day military! That recipe looks so yummy. Thanks for sharing it. Prayers for all the military. God bless all of these brave men and the families that sacrificed! What a wonderful post! And leave it up to a MOM to get something that would keep her son healthy. I love this story and the cookies look delicious too. What a lovely visit! Nice job, complete with history, wonderful wonderful!! They look wonderful..and I learned something new today! Hope all is well with the patients..I am sure they loved the cookies! These sound so good...will just regular syrup work, do ya think? I'll never be able to find Golden. And...I want to make them right now..TONIGHT!! I found this to be so interesting as I enjoy history. It was interesting to read a perspective of WWII from someone other than and American. Your photos are beautiful. The biscuits sound wonderful and what a neat history. I really enjoyed this post very much and will share it with my husband as he is also a History buff. Hi BJ! Love that new photo! I think you could try it with treacle, maple syrup or honey. Just try some with it first and see if you like the taste. I would love to know how you go with the recipe if you do try it with something else! Love to learn about history from other countries. The cookies look yummy to! Very interesting post! If you happened to read my post about the name plaques, baby Sarah's daddy is Australian. I've learned a bit about your country/culture from him. Thanks for this info. I never knew about this. On to the biscuits...anything with coconut is a winner in my book. However, I've never seen golden syrup in my store - I'll have to check next time I'm in Whole Foods. Learned something new today--a peek into your history. And those Anzac cookies--boy they look delicious! Wow, I totally learned something today -- THANK YOU! So Anzac Day, huh? I'm from America and have NEVER heard of it. Do you say, "Happy Anzac Day" if it's such a solemn holiday? Is it recognized by schools and work places? Thanks for sharing! Congratulations to the photo-award. No wonder, that's a very nice photo. And thank you for sharing this nice Australian cookie recipe with so much histroy. So interesting. I will try this oat cookies also. Very interesting history. And one to be proud of. Now I know I'd love that recipe, because homemade oatmeal cookies with coconut is my favorite. I'll have to try this one. Thanks for sharing. That sounds like a wonderful commemoration day to celebrate. love the cookies.. my fave.. anything oaty.. always drool! I was not familiar with ANZAC day. Thanks for the history lesson and the recipe! My husband is an Aussie, we actually watched the movie about this just a few weeks back with Mel Gibson...very sad. I will have to try your recipe at some stage! I love the history of this recipe....I have never seen golden syrup....I dated a New Zealander for ten years and we used to find a lot of his favorites at a place called world market........your pictures are so pretty! I came over here to thank you for visiting Becolorful and leaving such a gracious comment. I was surprised to see that you are in Australia. Very cool. The cookies look yummy. I am pretty much a dismal failure in the kitchen but with your thorough instructions and those great pictures I may have to give them a whirl. Natasha, what a terrific post -- so much to enjoy! A history lesson, and a cookery one too! Loved it. I don't suppose I can substitute corn syrup for the Golden? No, probably best not take the chance. One of my daughters attended the Univ of Edinburgh and encountered golden syrup while there -- isn't it fun to find out about each others' foods, and even native animals ... like our tiny chipmunks! Thanks for visiting That Old House today! Our chipmunks say Hi as they peek their tiny noses out from the stones! I am going to have to make these cookies -- oats AND coconut! Hey Natasha... nice to meet you! Thanks for your ind comment... when you said Happy Anzac Day I thought, that sounds like someone from down this way! Another Aussie friend. Lovely. Great tribute to our Anzac Troops; I love Anzac Day; it makes me feel so proud and patriotic/sentimental (is that wierd?). Appreciating our Aussie cousins who shared in the carnage and bravery. thanks for stopping by! It gave me a chance to pop over to your blog...now a happy follower! off to look through more of your archives! Beautiful post. I am going to try these cookies. Thanks so much for sharing. Thanks for visiting my blog and of course you may enter my give away! i have never heard of ANZAC day or the biscuits. What a wonderful story. thank you so much for sharing this information! This recipe looks yummy and would be great to take on hikes or camping trips, I will pass this along to my daughter and nieces, they all are "outdoorsy" and would love to make them! I remember Anzac days. I also remember my kids attending kindy and eating the Anzac cookies. I never quite understood what Anzac was all about. That was in 1990 (no internet in those days). Thanks Natasha! soldiers, history, cookies... wait bikkies... songs... hodgepodge is right... perhaps one day I will give them a try!? ;) have a great Sunday! Those look delicious! Thank you for posting the recipe! Thanks, also, for stopping in over at my blog and leaving the sweet comment! These would just SO NOT last a week in my house. Nope. You can tell by the ingredients that my family would snarf them up. Thanks again for the visit to my blog. Loved finding this one!